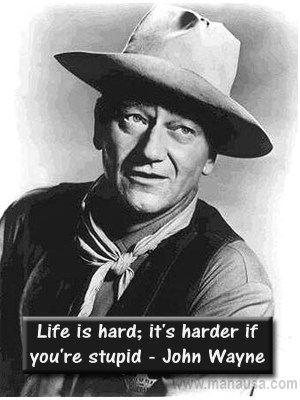 After watching a late night replay of a western film, I had to wonder what John Wayne would say about the real estate market today. John Wayne was one of the best known actors from the 1940s through the 1970s, and he usually starred as a rugged macho type who was calm under pressure. If "the Duke" was here combating the real estate market today, I think he would have a few choice words of advice for those of us who must contend with the problems of short sales, foreclosures, and bank owned properties in Tallahassee. If you have to sell a home, you must understand that values are still declining. You can either choose to wait out the market for many, many years to get more money, or you can just bite the bullet and sell your home today. Too often, home sellers want to try an unrealistic price, and it just does not work. I try to get them to understand that when it comes to value, it "is what it is." We cannot hope a buyer will pay more, it just doesn't work. There is so much information available on the real estate market today that there is no need to make a stupid decision. You can subscribe to the Tallahassee Real Estate Newsletter and stay informed on a weekly basis. You can read any of the 8,000+ pages on our real estate website if you really want to be sure to stay safe in a challenging market. With knowledge comes the power to make the right decisions when you sell a home and/or buy a home in the real estate market today. If you are faced with a need to move, you can take comfort in the fact that you are going to get to buy back into the same market from which you are selling. Sure, you'll take a big hit when selling, but won't you regain it when buying? The market will recover, and whether you are in your current home or your next one, it will be more valuable than it is in the real estate market today. The key is being courageous enough to make the move. If you are ready to sell a home in the real estate market today, just drop me a note and we can schedule a time to discuss your specific situation and needs. Home run today, Joe! Keep 'em coming! Does anyone know from which John Wayne film "Get off your horse and drink your milk" is from? Or was it a personal quote? I'm not sure Ferdinand ... and there are many different forums on this topic that are easily found with a Google search.